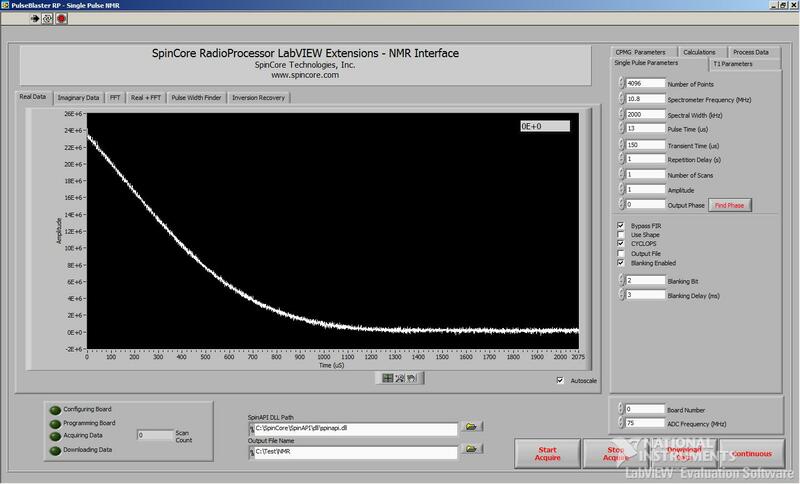 PBLV-RP NMR Interface is a user interface created with LabVIEW to provide all the tools to use the RadioProcessor and iSpin-NMR system. NOTE: If using the latest version of SpinAPI, inputting a "Number of Points" that is not a power of 2 and/or inputting a "Number of Scans" that is not a multiple of 4 (when CYCLOPS is enabled) will cause the LabVIEW NMR Interface to report an error and force the program to be restarted. NOTE: If using the latest version of SpinAPI, trying to run the CPMG program or calculate a value for T2 will cause the LabVIEW NMR Interface to report an error and force the program to be restarted. If you wish to perform these experiments please use our C programs instead. NOTE: If using the latest version of SpinAPI, trying to output a file for T1 Inversion Recovery will cause the LabVIEW NMR Interface to report an error and force the program to be restarted. If you wish to retrieve data for a T1 Inversion Recovery scan, please run the scan without outputting a file and then right click on the data window to export the data manually.